Three words come to mind when gazing at motor yacht AQUA LIBRA 131 – Inspirational, Versatile and Seductive. 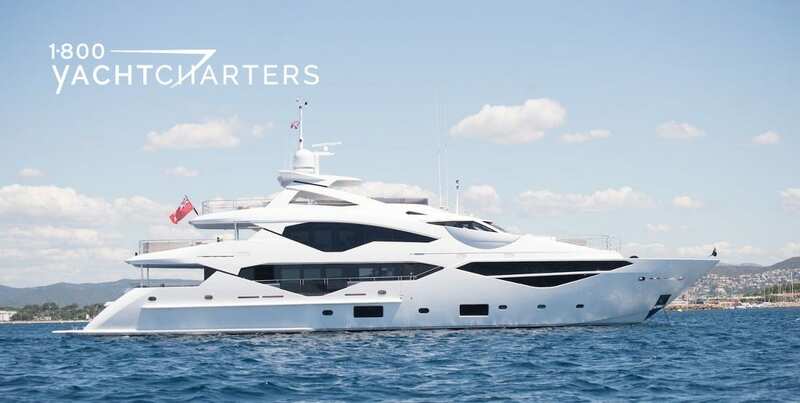 The tri-deck Sunseeker 131 motoryacht epitomizes everything an experienced charterer seeks in a yacht for hire. 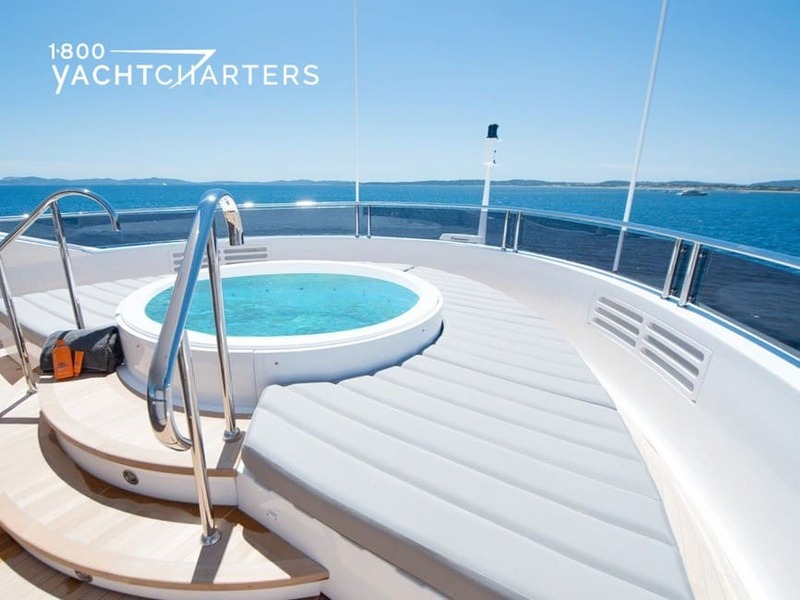 With accommodations for up to twelve lucky guests, the surroundings envelop the guests in sublime luxury, and scale and layout of this immense private Greek yacht charter vessel are awe-inspiring. 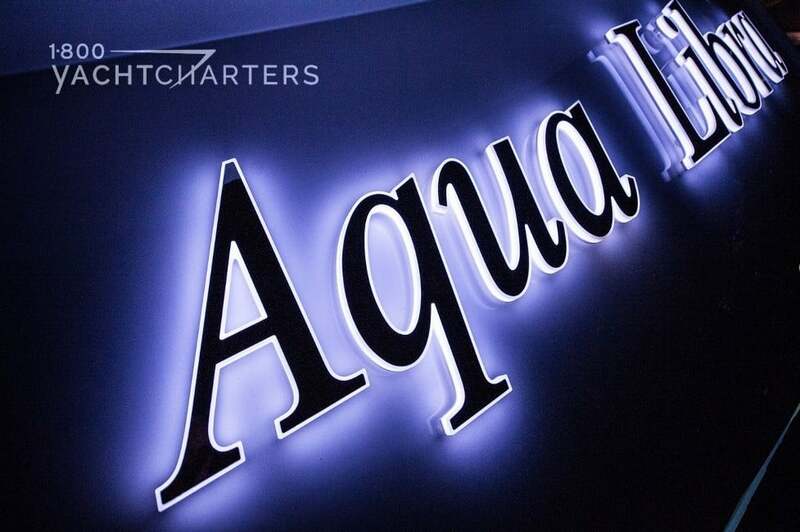 Without questions Sunseeker 131 yacht AQUA LIBRA is one of the finest examples of a modern day charter vessel. 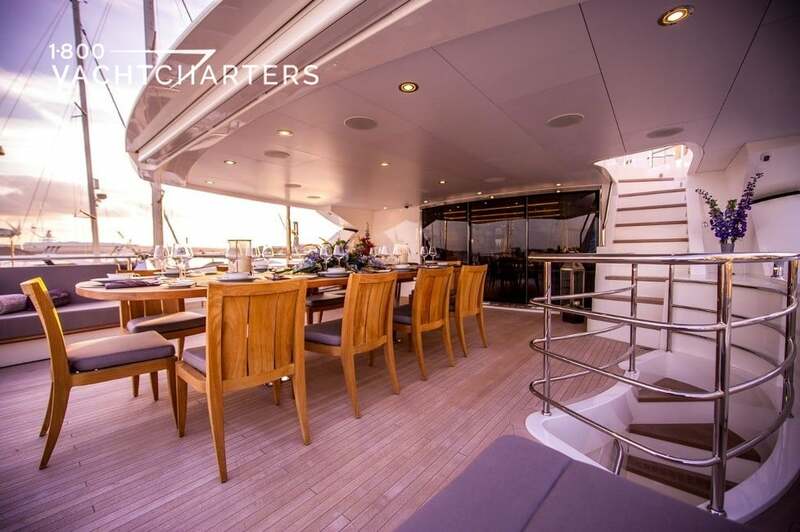 The main deck of AQUA LIBRA motor yacht features a salon/lounge, open dining area, and a full-sized galley where the yacht’s talented chef can create amazing meals for the guests. One level up, on the upper deck, charter guests can socialize in the sky lounge, and entertain at the cocktail bar. Still higher up is the open-air skydeck – home to a warm Jacuzzi tub, wetbar, and plenty of seating areas and chaise lounges. As if that is not enough space for relaxing and socializing, there are even more areas that serve as conversation areas, al-fresco dining spaces, and full-sun seating spots. Remember, this is only a 131 foot (40 meter) yacht, not a 60 meter superyacht. 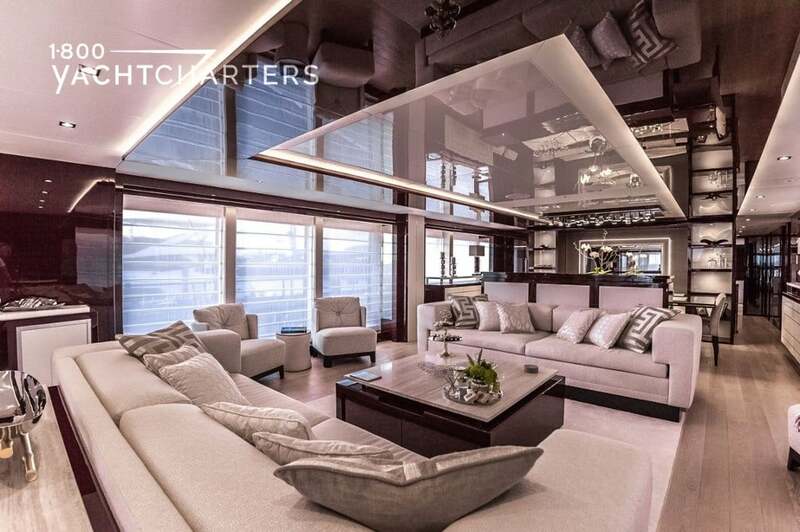 How is it possible this yacht can also boast an aft deck lounge area AND a bow sunbathing /lounge area? 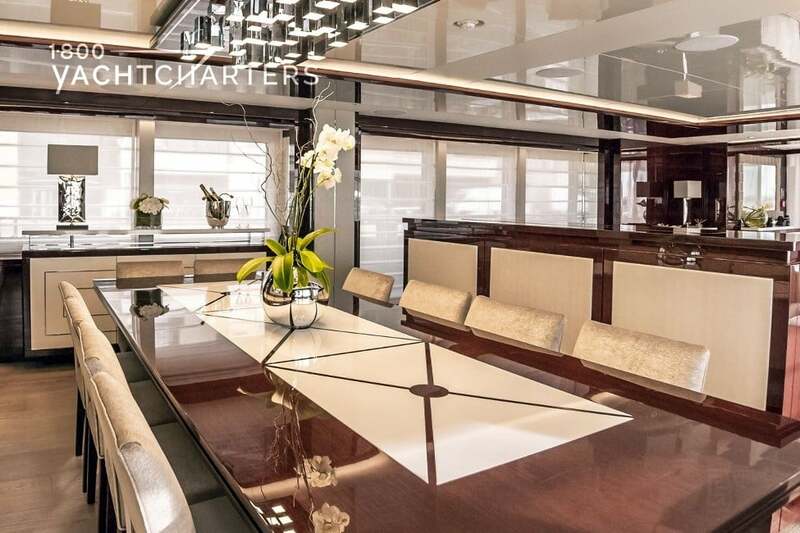 This Sunseeker 131 carries comfort and lavishness to a level rarely seen on a 40 meter yacht. VIP cabins, each with queen size beds. Two twin cabins, which re ideal for single guests and children, can be converted into double cabins with king size beds – now that’s versatility at its best! One twin also features a Pullman berth. Each guest cabin features ensuite facilities. 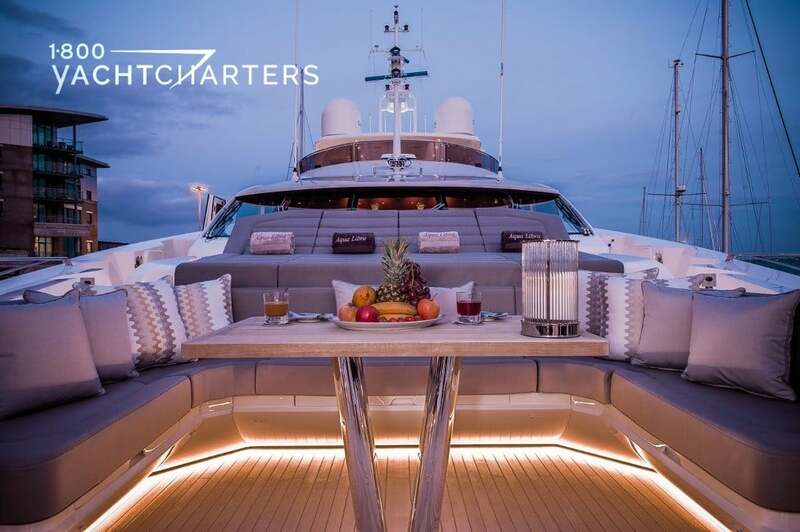 It’s hard to imagine any guest becoming board onboard this Greek yacht charter vessel. 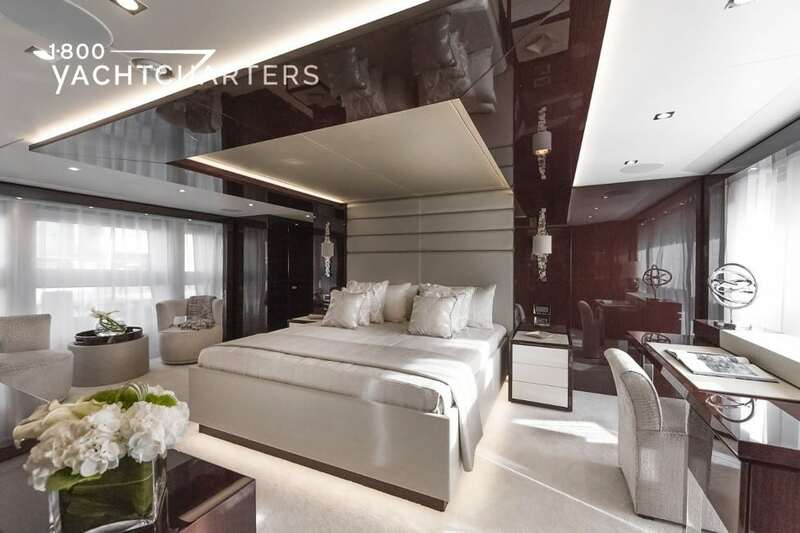 Entertainment options include a cinema area with 75’’ TV, fed by a vid-on-demand centralized system, Sonos AV System plus Apple TVs and satellite TV service. I-pad controllers handle the lights and shades, and Wi-Fi throughout the vessel keeps everyone linked with the outside world. Fitness buffs will enjoy the gym and exercise equipment, and a wide array of watersports toys.